Seaward International, Inc. recently delivered nine 2-foot-diameter by 10-foot-long netless highcapacity foam-filled marine fenders to the Virgin Islands Port Authority. The fenders were installed at the Port Authority pier at Gallows Bay on the island of St. Croix, where they are used by Renaissance Cruise Line ships which regularly call at the port. The use of the Seaward fenders enabled a critical delivery schedule to be met and the fenders were installed without any costly modifications to the pier being necessary. Additionally, to match the clean appearance of the ships hull and to eliminate the black marking caused by other types of hard rubber fenders, and by the rubber tire fenders previously used at the pier, the Seaward fenders were supplied with a white non-marking exterior. The fenders, along with complete mounting hardware, were shipped within two weeks after the order was received and were installed on schedule and are currently in operation. 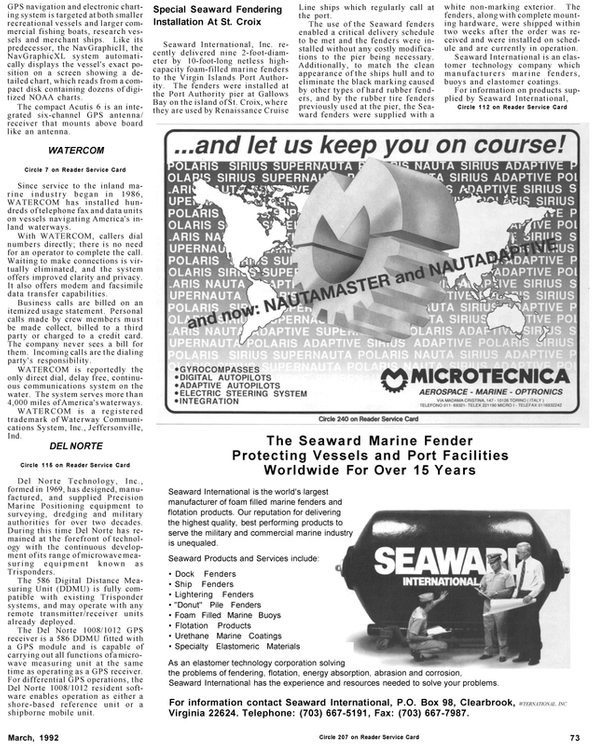 Seaward International is an elastomer technology company which m a n u f a c t u r e r s marine fenders, buoys and elastomer coatings.